What is Sleep Disorders Dentistry? Take the Sleep Quiz to find out how healthy your sleep is. If you answered yes to any of the above questions you could suffer from Sleep Disorder Breathing. 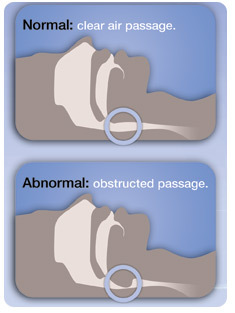 Sleep Disorderd Breathing (SDB) refers to a wide spectrum of sleep-related breathing abnormalities related to increased upper airway resistance. They include snoring, upper airway resistance syndrome (UARS), and obstructive sleep apnea-hypopnea syndrome. Sleep disorder breathing affects one-third of the US population. It manifests itself in a myriad of ways- ranging in severity from snoring to a potentially fatal disorder called obstructive sleep apnea and encompasses everything in between. Snoring and sleep apnea have been associated with hypertension, cardiovascular disease, stroke, depression, family discord, sexual dysfunction, obesity and even death. In order to determine the severity of your problem, your dentist will "map" your nasal passages and your airway with a suite of diagnostic equipment called the Eccovision, a self-contained processor emitting sound waves through two tools - the rhinometer and the pharyngometer. It's like drawing a picture with sound. It's quick and completely painless. The rhinometer uses acoustic reflection to map the nasal passages, searching out any obstruction or enlargement. As for the airway itself, the pharyngometer is used. This tool sends sound waves down the throat, noting its diameter, collapsibility, and problem spots. Then, if a problem is discovered, your dentist can fit you with the oral appliance, fitting it effectively with the Eccovision to position the airway correctly, allowing for maximum patency (airway muscle strength and openness). Click here for more Treatment Options.